This item, titled "Opening of the Santa Fe Trail," was written by Charles Cecil Howes in the 1940s. 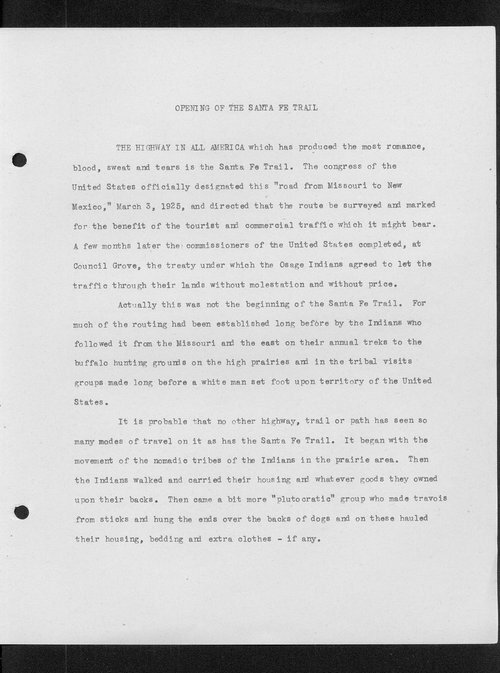 Howes explains that "the commissioners of the United States completed , at Council Grove, the treaty under which the Osage Indians agreed to let the traffic through their lands without molestation and without price." Howes also explains that the Santa Fe Trail had long been in use, and began with "the movement of the nomadic tribes of the Indians in the prairie area. Then the Indians walked and carried their housing and whatever goods they owned upon their backs." Call Number: Charles Cecil Howes Coll. #393, Box 1 Folder: "Jayhawk Sketches"